The campaigns for the new Vitara Brezza is running from quite a long time. Maruti Suzuki has now set a target of selling around 5000 monthly units of its upcoming compact SUV – Vitara Brezza. 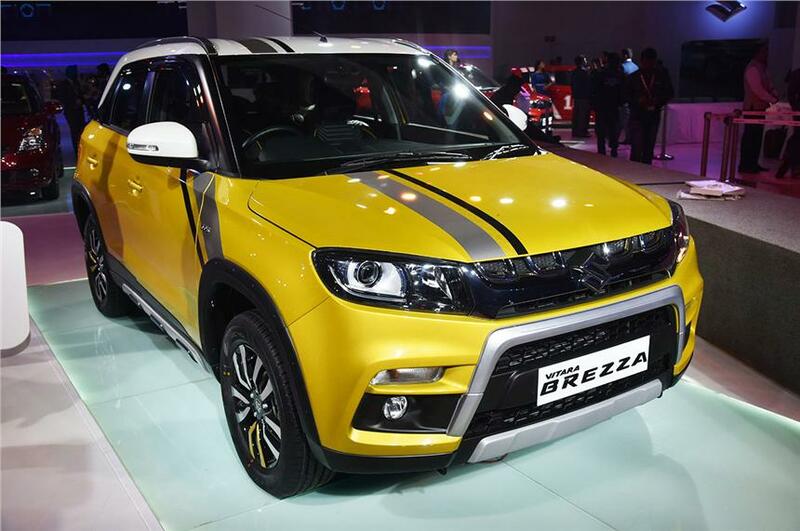 The launch of new Vitara Brezza would happen in India by the end of March 2016. The company is looking actively to expand its market share with the segments where there is no presence at the moment. 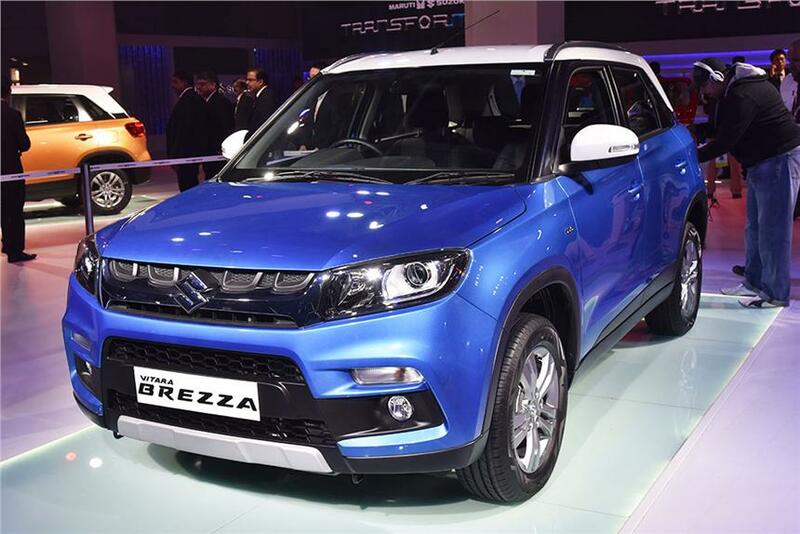 While the Vitara Brezza is scheduled to be launched in the month of March, the car has already been unveiled at the 2016 Auto Expo in Greater Noida. Vitara Brezza is a sub 4-metre SUV that competes with the Ford Ecosport as well as Mahindra TUV300. The Brezza is a 5-seater SUV that will be an all-new vehicle. Maruti Vitara Brezza Bookings have already started. The booking price starts at 21,000 INR and it can be booked at nearest Maruti Suzuki dealership. Maruti Vitara Brezza is made available in five different colours – white, silver, red, orange and blue colour options. Let us talk about the exteriors of Maruti Vitara Brezza. The compact SUV is based on the Swift platform and it follows the new design language. 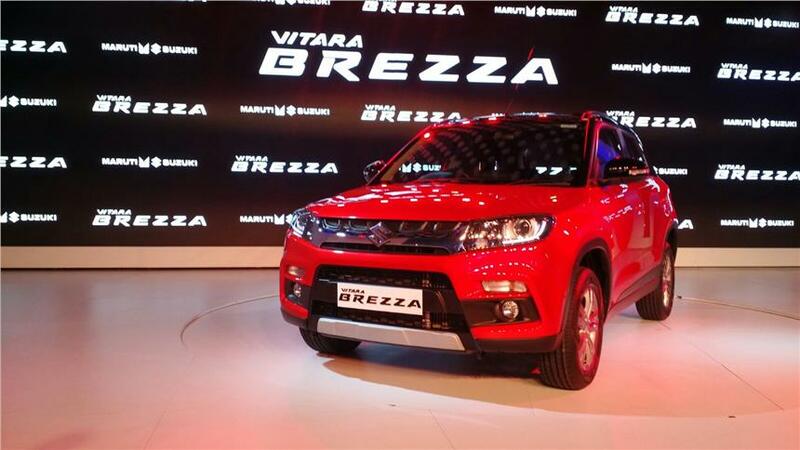 The all new Vitara Brezza gets a thick chrome grille that runs across the large headlamps. Vitara Brezza comes with daytime running LEDs and the side profile of Vitara Brezza is very similar to that of Vitara. The B-pillar is blackened and the shallow glass area gives this car a SUV look. The rear of Vitara Brezza resembles the Vitara styling. The Vitara Brezza is based on Swift platform and not on the new Maruti Suzuki platform. This makes it a bit heavier, but then the added advantage is that the price of the spare parts would be lesser on the Vitara Brezza and it would be sold through huge network of Maruti Suzuki dealerships. Talking about the exteriors of the car, the upcoming Vitara Brezza has an all-new interior when it comes to the Indian car market which is derived from Vitara. The 5-seater SUV is loaded with features like keyless entry, push start button, then there will be an integrated infotainment system with touchscreen, the car would also get satellite navigation, reverse parking camera, bluetooth and even USB and aux input. The Vitara Brezza would be getting the leather seats and the base variant is offered with single airbag and ABS. There is also climate control air-conditioning present in the the Vitara Brezza. The plastic quality of Maruti Vitara Brezza is pretty decent, there is a similar fit and finish which you see in the Swift. The front row of the car is spacious and you sit in a good commanding position. The boot space size of Vitara Brezza is 328 litres. Vitara Brezza is powered by 1.3-litre diesel engine which is capable of churning out a 90bhp of power, delivering the torque output in the range of 210Nm. The engine of all new Maruti Vitara Brezza is mated to a five-speed manual transmission gearbox and there is also AMT version available for the diesel engine. Vitara Brezza’s diesel engine shall come with SHVS (Smart Hybrid Vehicle by Suzuki) that uses the start stop hybrid technology. The Vitara Brezza would also be getting a 1.5-litre diesel engine. This engine has a variable geometric turbocharger that helps to improve the power delivery even at pretty low engine speeds. The SHVS engine offered by Maruti Suzuki is seen on Maruti Ciaz and even the Maruti Ertiga. The power of this engine is good and we are very well familiar with this engine. The turbo boost of this engine is at about 1900rpm and that is when the real thrust comes in. If you want to be in your powenband, drive between 1900rpm to 3400rpm. Then driving in city or even the highway will be easy. The Vitara Brezza is based on the Swift platform and hence it won’t have been difficult for Maruti to test the vibrations of the diesel engine on this platform. One could also expect an AMT (automated manual transmission) to be made available for the Vitara Brezza in coming days. The LDi variant is the base model of Vitara Brezza. The Vitara Brezza LDi variant would come with features like airbag for driver, integrated music system with bluetooth support, electrically adjustable ORVM, power windows in the front, dual chamber headlamps, rear seat flip and fold, unique turn indicator in bumper, inside grab handle, power door locks, manual Air conditioning system, engine immobiliser, tilt steering wheel and manual day and night mirror. The LDi variant also offers you an optional pack that provides the co-driver an airbag and even ABS (anti-lock braking system). Being the second variant of Maruti Vitara Brezza, this trim would include all the LDi variant features and additionally gets following features: seat back hook, rear power windows, keyless entry system, security alarm, roof rails, electromagnetic tail gate, gear shift indicator, seat back pockets, passenger vanity mirror, IP Upper box, body coloured outside door handles, rear parking sensors, fabric insert on inside door trim. The optional VDi package would come with co-driver airbag and ABS along with all the features offered in VDi. The ZDi variant falls in the higher end. The ZDi Vitara Brezza gets features like mood light in speedometer, pain black centre console, larger tyres (215/60R16), passenger airbag, ABS (Anti-lock Braking System) with EBD (Electronic Braking Distribution), auto AC, projector headlamps with LED, alloy wheels, 60:40 rear seat split, passenger seat under tray, roof rails, skid plates, chrome door handles and even front fog lamps. ZDi+ is the Vitara Brezza’s pretty most expensive variant that comes with cooled storage in upper box, SmartPlay with Apple CarPlay. This particular car variant also gets a touchscreen system with satellite navigation and reverse parking camera. The other features include push start and stop button for the engine, cruise control, auto headlamps, rain sensing wipers, electrically folding ORVMs, tweeter and storage under front armrest. Let’s talk about the price of this amazing looking car from Maruti Suzuki. 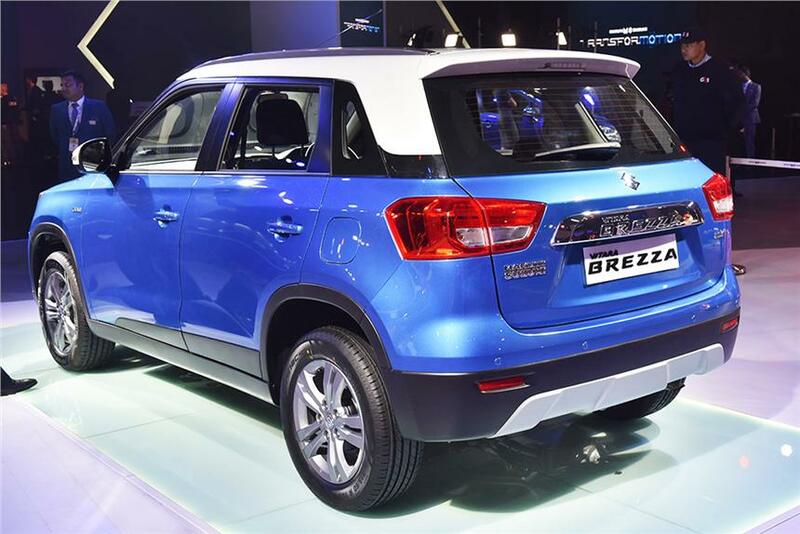 Maruti Suzuki plans to aggressively price the new Maruti Vitara Brezza. The on-road price of Maruti Vitara Brezza is expected to be between INR 7.5 lakhs to INR 12 lakhs. 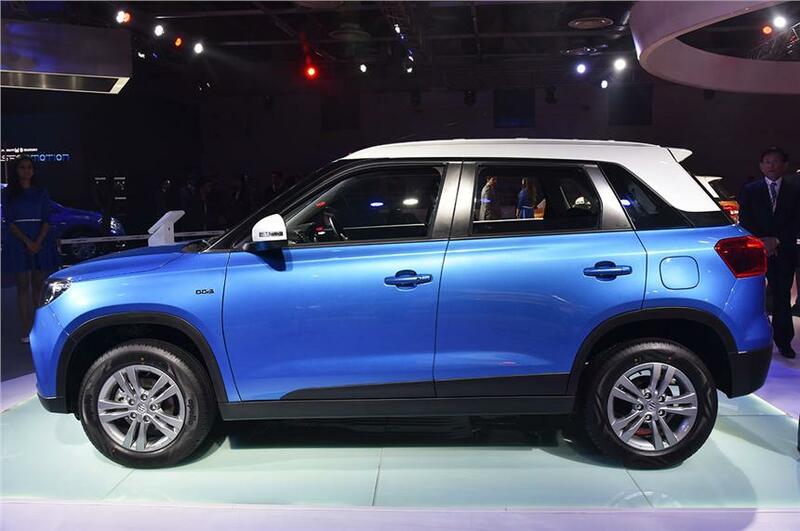 The launch date of the Maruti Vitara Brezza is on March 2016. Also read: Maruti Vitara Brezza sets a milestone by fully developing the car in India.